SASANIAN KINGS. Shahpur II (Šābuhr). 309-379 AD. AR Drachm. 3,70 gr. - 24,5 mm. Struck circa 320-379. O:\ Head of Shahpur right. R:\ Fire altar and attendants. Gobl MDK 1297; Tafel 137. XF. SASANIAN KINGS. Shahpur II (Šābuhr). 309-379 AD. AR Drachm. XF. Small flan, thick. 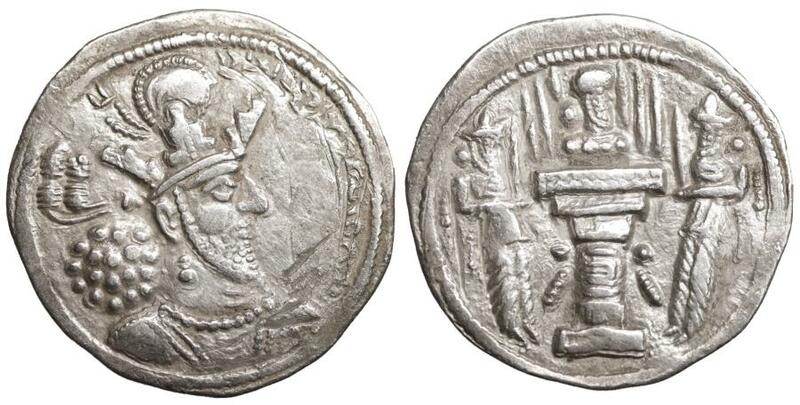 SASANIAN Shahpur II (Šābuhr). 309-379 AD. AR Drachm.